First time at Flawed yet Functional? Welcome! Start here to get a feel for what my heath challenges are and why I’m managing them the way I am! If you haven’t followed along, this week I’m sharing my top 5 breakfast, lunch, and dinner recipes that I’ve made and love (and the whole family loves!). 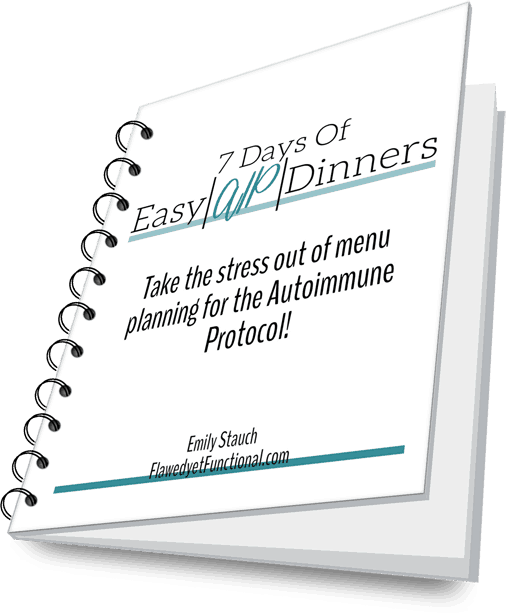 Today, I’ll finish up this mini-series with a review of my Top 5 Autoimmune Protocol Dinners! Dinner is my one meal of the day that I love variety. I make a fresh dinner almost every night, unless the leftovers are piling up. Oddly, I am one of those people who can eat the same breakfast and possibly lunch day in and day out but the same dinner No Way. I need variety! Who doesn’t like handheld food? I originally selected this meal as a fun chicken nugget-like meal for my kids’ sake, but the flavors in these poppers are definitely adult-friendly too! The whole family gobbled these up. Add a couple vegetables on the side, and you’ve got a complete meal! A fond flavor memory from growing up are my mom’s sage pork chops. I spent some time last winter perfecting my Autoimmune Protocol compliant version of this comfort food. It is now on regular rotation in our diet. To round out the meal, I serve this with a couple roasted vegetable or on a garden salad. Burgers of any sort are regulars at our dinner table. I found this recipe to be versatile, easy, and tasty. I’ve made it using ground turkey and ground chicken, and honestly, couldn’t tell the difference. I love that it is packed with spinach that is not easily noticed when eaten. For serving, I like to make this avocado dip to put on top the burgers then I just eat them with a fork. A lettuce wrap would do too, but I find them a bit cumbersome, so I usually just use utensils! This hearty stew is a favorite of mine once the weather turns cold. I do not have an insta-pot so I just make the soup on the stove. It turns out lovely every time! A soup that uses ground beef versus more expensive cuts is something I look out for. Try this one once it gets cold again! You’ll love it! For ease of getting dinner on the table, I plan in 1-2 slow cooker meals into my two week menu plan. Pork carnitas are tender and delicious and, bonus, makes enough for several meals! I make these even in the summer because the slow cooker doesn’t heat up the kitchen, and pulled pork doesn’t sit heavy on a warm day. Serve it with lettuce wraps, on a bed of salad greens, plain with vegetables on the side, or mix it in with your breakfast hash the next day. It’s a very versatile dish! I hope you see what variety of meat, vegetables, textures, and flavors are possible on the Autoimmune Protocol diet. These recipes are tried and true in my house, and I’m sure they will be in yours too. 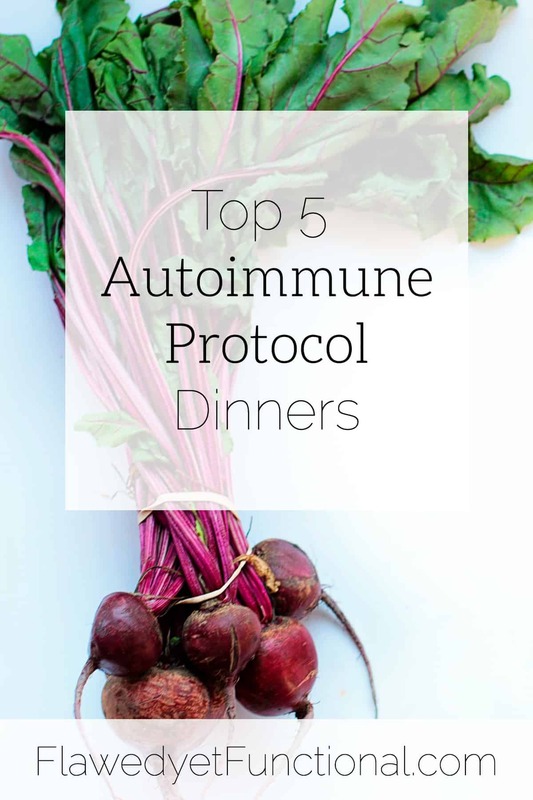 If you need inspiration on what to put on your menu plan when beginning the Autoimmune Protocol, start with these Top 5 Autoimmune Protocol Dinners! Do you like variety at dinner time too? Or are you more comfortable rotating between a few tried and true dishes? Want to remember this? 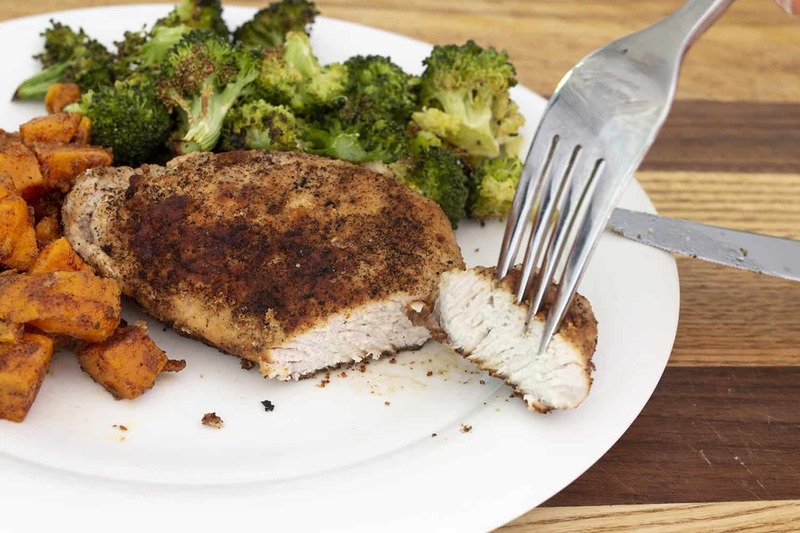 Pin Top 5 Autoimmune Protocol Dinners to your favorite Pinterest board!